While profitable corporations require roads, police protection, and other public infrastructure and services as much as the rest of us, New Mexico has ensured that they will be paying much less of the cost to maintain them. The tax cuts for corporations enacted by the state Legislature and signed by the Governor in 2013 are proving to be much more expensive than originally estimated. So much so that within the next few years we will lose 60 percent of our corporate income tax revenue. These steep cuts reduced the top corporate income tax (CIT) rate from 7.2 percent to 5.9 percent and allowed manufacturers to apportion their profits in a way that is extremely advantageous for them—but costly for the state budget. Stunningly, the cuts were enacted by legislators in the waning minutes of the 2013 session without a fiscal impact report (FIR)—an estimate of the cost of legislation that is created for virtually every bill under consideration. They were told (erroneously) that the tax cuts would be “paid for” with new revenue and some savings. The generous tax cuts were partially paid for by a slight increase in revenues from a change in how large retailers could file their tax returns. But it will be nowhere near enough to cover the enormous loses. As subsequent revenue estimates were made, the revenue picture continued to get bleaker and bleaker. In August 2013 (shown in the light blue line), state officials further reduced the projected CIT revenues—to $260 million in FY13 and $278.4 million in FY17—without explanation. This showed the FY17 $111.6 million loss growing to a loss of $131.6 million. 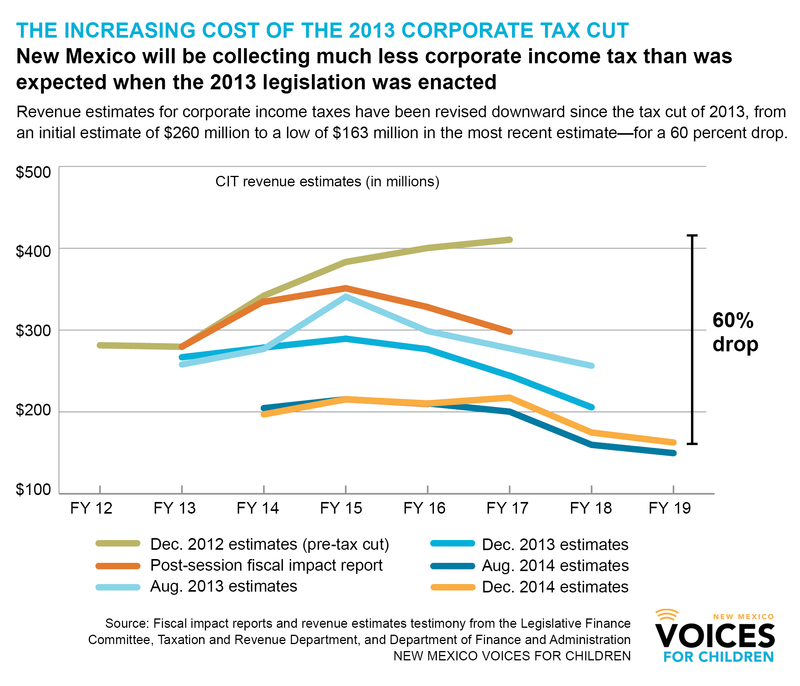 By August 2014 the revenue picture for the CIT had deteriorated even further (darkest blue line). The expected revenue from the CIT had fallen drastically to $200 million in FY17, $160 million in FY18 and $150 million in FY19. That was a drop of $80 million more than had been expected in the post-session FIR—meaning CIT revenues for FY17 are expected to fall by half. When revenues for FY18 were first estimated (in August 2013), it was expected to be $258.5 million. By the December 2013 estimates, it had fallen to $206 million, then to $175 in the testimony given to the Legislature earlier this month. State officials have not been able or willing to explain the drop. The December 2014 testimony also projected CIT revenue falling by another $12 million to $163 million in FY19. If $410 million, the original estimate of FY17, is taken as a baseline, the estimated yield of the CIT will drop by $247 million, or 60 percent, between FY17 and FY19. What accounted for the steep falloff in corporate tax revenues in FY17 and FY18? So far, state officials have been unable or unwilling to address the steep decline. However, corporate profits, the base for the CIT, have been steadily increasing, and there is no indication that this trend will end soon. That would mean, logically, that the effects of the 2013 tax cuts were more drastic than originally thought. The obvious question is: Do the ever-dwindling estimates of CIT revenue mean that the cost of the 2013 corporate tax cuts were grossly underestimated? It certainly would seem so. It looks as though the CIT was decimated by stealth by the 2013 corporate tax cuts. 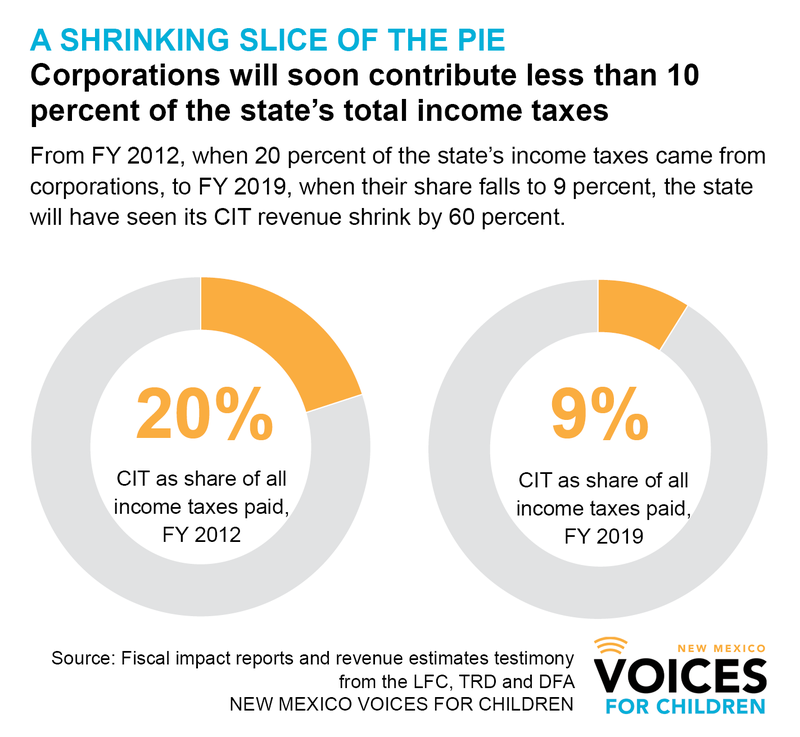 In FY12, corporations paid 20 percent or one-fifth of total state income taxes. In FY19, corporations will pay just 9 percent of total income taxes. In FY12 corporations paid 5 percent of total state taxes. In FY19 corporations will pay just 2 percent of total state taxes. If corporations pay less, and they clearly will, then more of the responsibility for funding state services will be picked up by taxes on people, through the gross receipts tax, other consumption-based taxes, and the personal income tax.